Eco-Choice Windows are a perfect solution for architects and builders looking for sustainable options. By simply specifying Eco-Choice Windows you are assured the product has been researched and designed to meet Leadership in Energy and Environmental Design (LEED®) criteria. 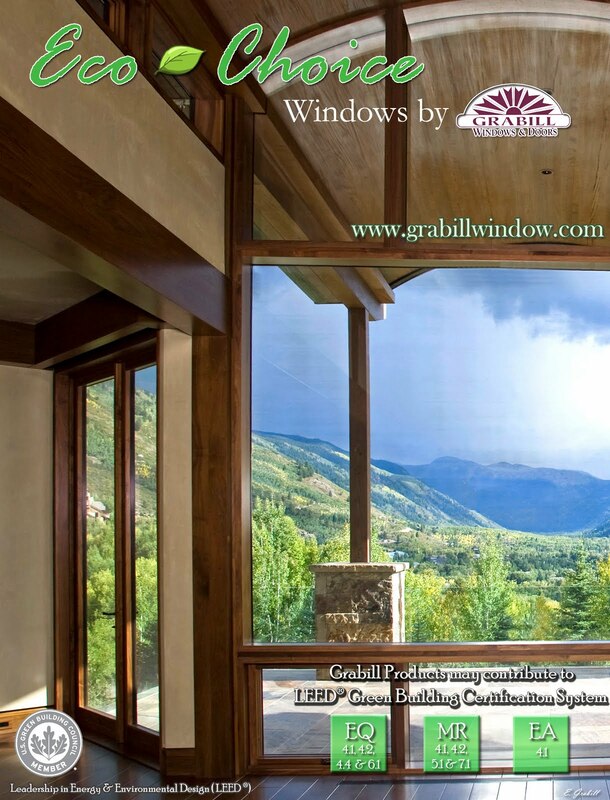 For years, we at Grabill Windows & Doors have been committed to making high performance Architectural windows that meet and exceed Energy Star ratings for efficiency. We take it one step further with the newly introduced, Eco-Choice window. This window can be constructed of solid wood or aluminum clad. Through research, design, development and testing Grabill has standardized a “green” window built with sustainable, low emitting and recycled materials. The Eco-Choice window materials include FSC certified lumber, hardware and aluminum fabricated with high post consumer content, and low VOC glues and finishes. As with all Grabill products, using regional suppliers when ever possible saves energy costs and puts money back into the local economy. Projects that are within 500 miles of Grabill earn additional LEED® credits as well. Grabill Window products are built with integrity and built to last. Our high standards of traditional craftsmanship, integrity and service are evident in the Eco-Choice window. For additional information on the Eco-Choice window, and credits fulfilled with Grabill Products, please visit: Grabill Green. For more information on Grabill products, please visit www.grabillwindow.com or email info@grabillwindow.com. Your Blogs are awesome. I'm amazed that i could find it on internet. Liked your blog, window films singapore is there to provide you best film at fair price so that you can get rid of UV rays entering into your house, which used to destroy expensive items.